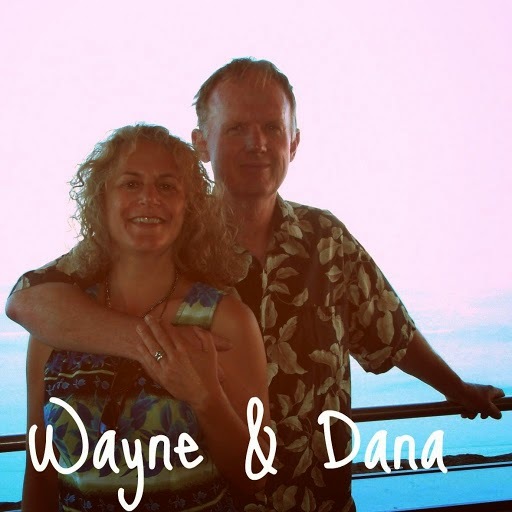 Whangarei's Returned Service Association (RSA). 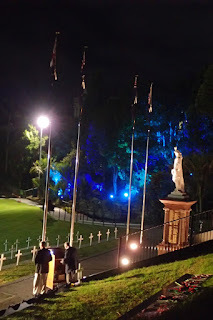 Seemed every New Zealand museum, regardless of focus or size, ANZAC (Australian and New Zealand Army Corps) commemorations were heavily featured. Perhaps it’s because it’s the 100-year anniversary of “The Great War.” World War I (WWI)’s devastatingly bloody battle at Gallipoli, a flashpoint of recognition of the great sacrifice made by those who lost their lives in the battle. Many believe Gallipoli unified and oft-divided Kiwi nation across all classes and races in their grief. 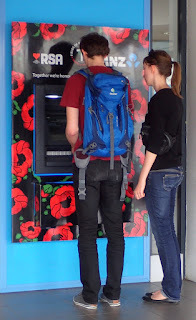 Even the ATM sported Anzac poppies. Every year on April 25th, per Wikipedia “Anzac Day is a national day of remembrancein Australia and New Zealand thatbroadly commemorates all Australians and New Zealanders "who served anddied in all wars, conflicts, and peacekeeping operations" and "the contribution and suffering of all those who have served." Anzac’s managed hold true to its intent by deliberately resisting “Monday-fication” that dilutes so many holidays. However, by luck of the draw, we happened to be in New Zealand when Anzac fell on a Monday. at the lower left, and color guard, upper right. 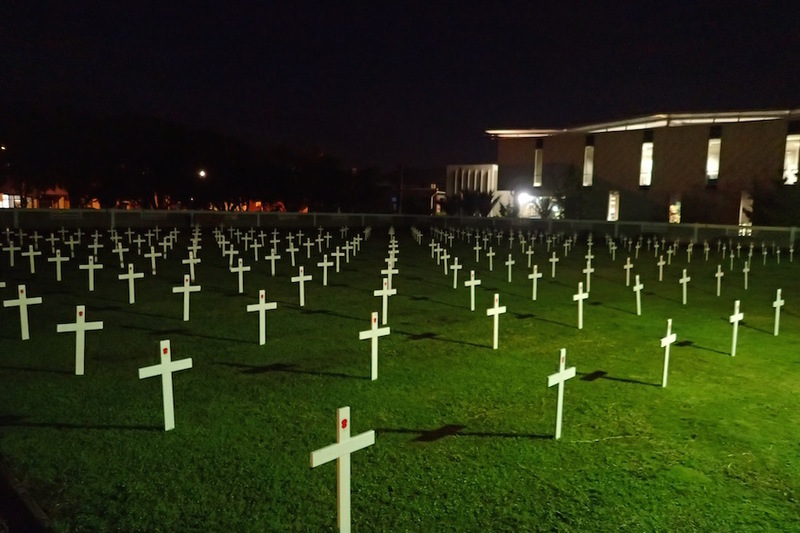 “Meet me at the ablution block at 5 am if you’d like to join me for the dawn service,” Litara said. Litara’s Western Samoan by birth, though she’s lived in New Zealand many years and in my definition is as Kiwi as any All Black fan. Sadly, I don’t consider myself that patriotic, yet I wanted to sense this small but important moment that appears deeply core to the New Zealand identity. Whangarei, North Island, New Zealand. 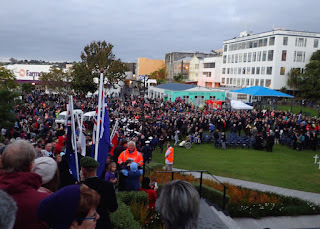 Litara, French-Canadian cruiser and fellow walking buddy Louise, and I joined what eventually became a crowd of several thousand who participated by attending the remembrance ceremony. 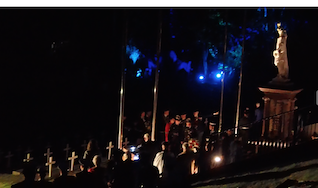 We were early, watching the speakers, color guard and band set up, well before the parade wended its way from the Returning Service Association (RSA) to the war memorial site where the ceremony was held. 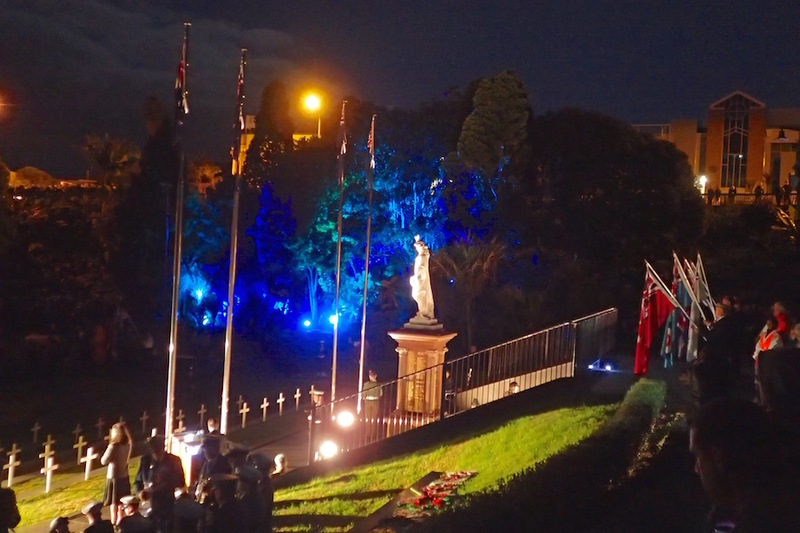 Anzac ceremony just ending, Whangarei, New Zealand. “We will remember,” was the message of profound respect conveyed to honor and credit those who gave their lives and thus helped make New Zealand what it is today. disperses. Whangarei, New Zealand, Anzac Day. It was interesting to note the participants did indeed appear cut across all classes and age groups – with the young in particularly strong attendance. Death, after all, like life, is one experience we all share. The next day, on our usual climb up Mt. 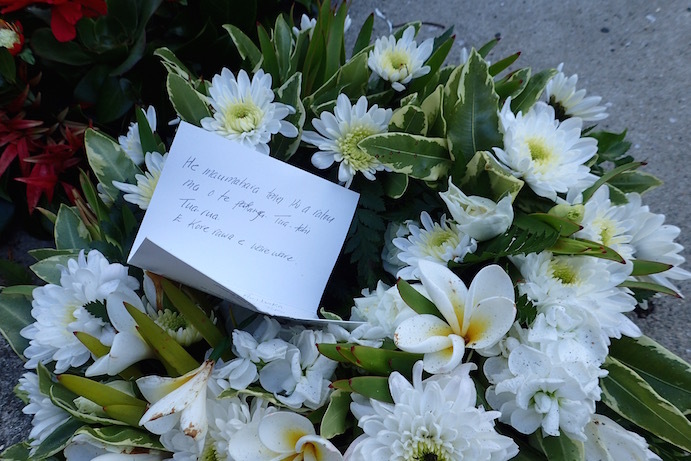 Parihaki, we noticed several wreaths laid at the base of the summit’s war memorial. Several of the cards accompanying the wreaths were in Maori one even laced with frangipani, fitting as Parihaki is considered a holy place, one now dedicated to remembering those lost in the battles held there long ago. 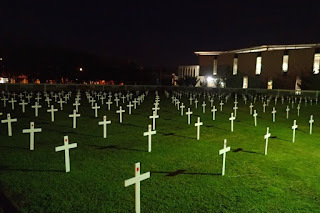 From the Talmud, we’re taught, “We live on in the lives of those who knew us.” In New Zealand, those who fought for their country are indeed well remembered. As we leave New Zealand, it is with a sense of gratitude to experiencing the wonder of this beautiful country, and more so, the generosity and kindness of it people. We hope someday to return. cross under the bridge lift on our way out. As you read this, we’ve just resumed cruising. 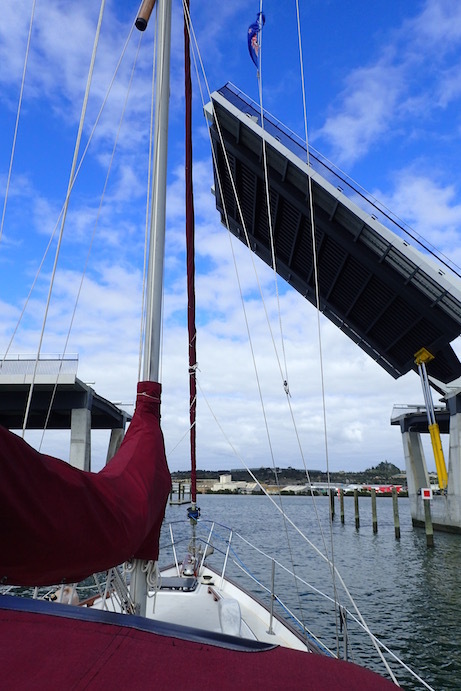 We left our pole mooring in Whangarei's Town Basin Marina (S35.43.414 E174.19.539) at 11 am today and pausing overnight 12 nm downriver at Marsden Cove (S35.50.235 E174.28.156), assessing whether weather's good enough, or not yet. Our first stop's Fiji, ~1170 nm, our 2nd longest ever passage. 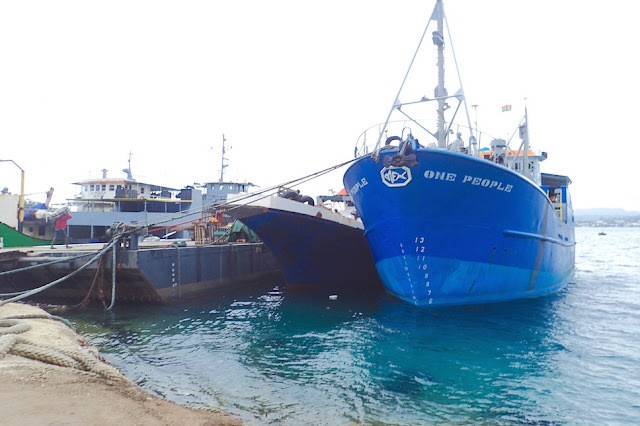 Once we clear New Zealand customs and set sail, it will take us about two weeks to get to Fiji.